Having never played that game, I can't say. 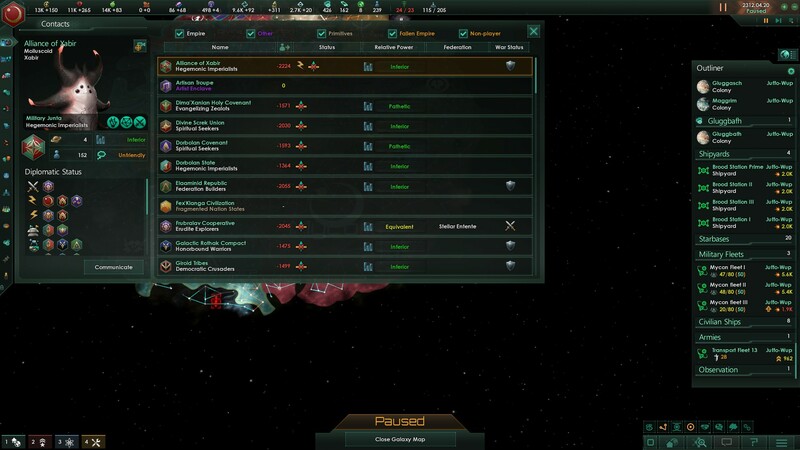 For a devouring swarm diplomacy amounts to: Insult, declare war, and I make sure to insult the non regularly. We are the Mycon, we are the agents of Juffo-Wup you are non, you must become Juffo-Wup or Void. 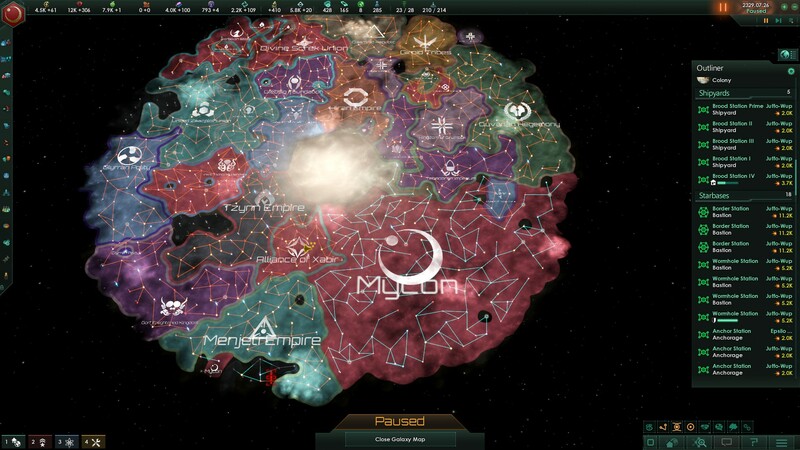 And, on the topic of the Void, it's time for some more wars! Lightning wars to be exact! At this point we are so powerful that almost no one can match us, not even those wearing The Infamous Lewd Monocle! And so it was that We proceeded to launch a slew of kinda dull, sorta slow, Lightning Wars! 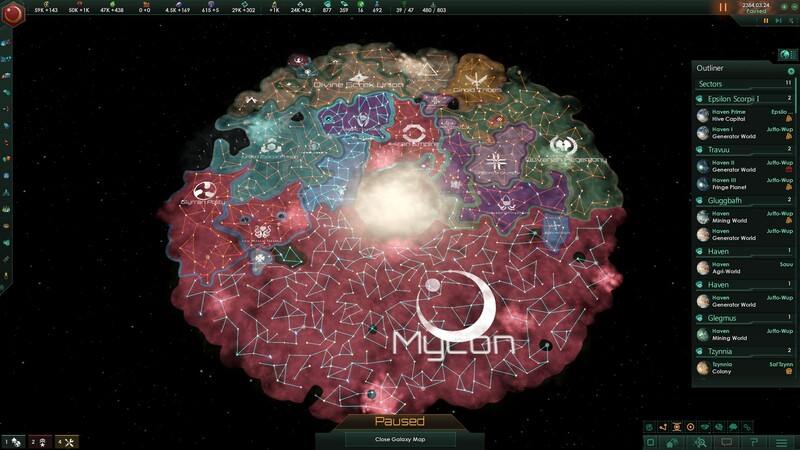 Here We are before the lightning wars, economy is great, fleet is overpowered, stations are well established. 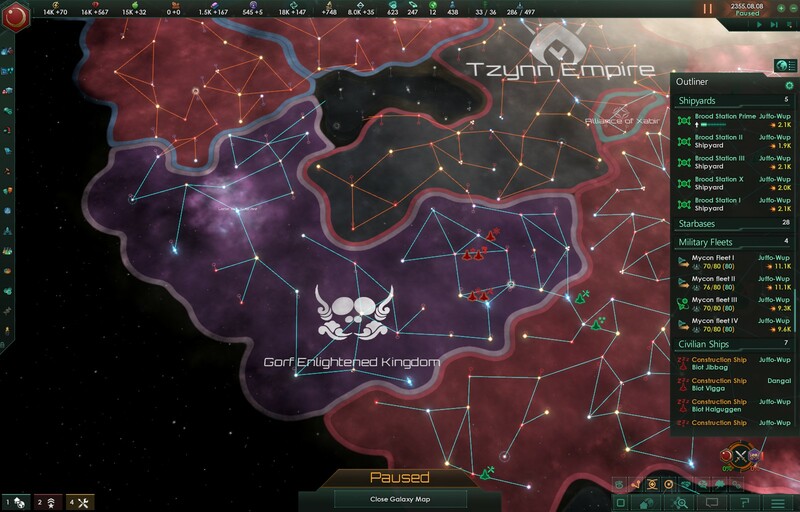 Suddenly We find our self's declaring war of the two neighboring empires, The Menjeti Empire, and The Alliance of Zabir. 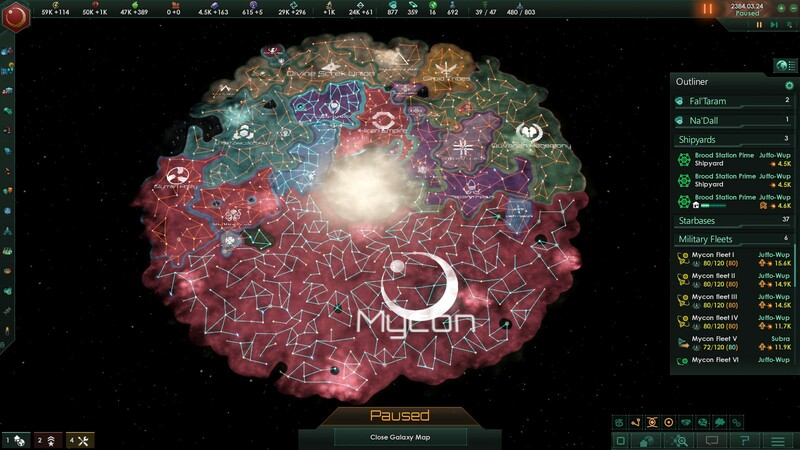 They had a defensive pact, so it was all or nothing. I at first thought this would be a very hard fought war. 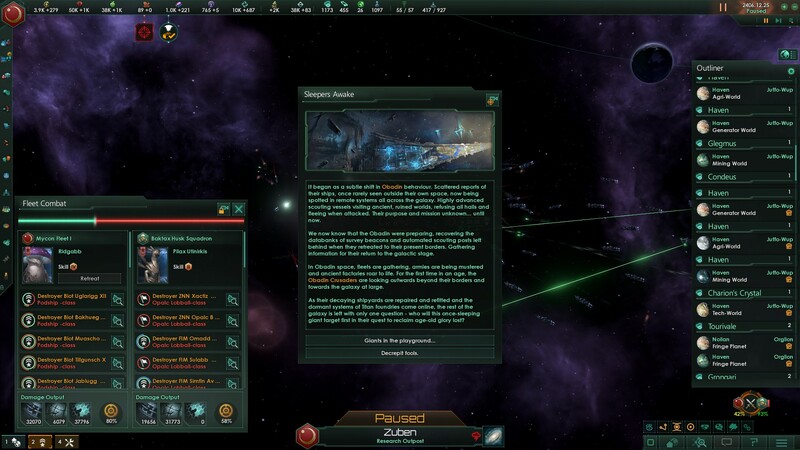 But the Zabir' didn't even try, their fleets kept patrolling the same space as before the war. We quickly swept across the space of the Menjeti and before we knew it, had all but wiped out the Zabir, if not for their war with the Tzynn. Quick as We could OUR space was made Juffo-Wup and you could never tell the difference. 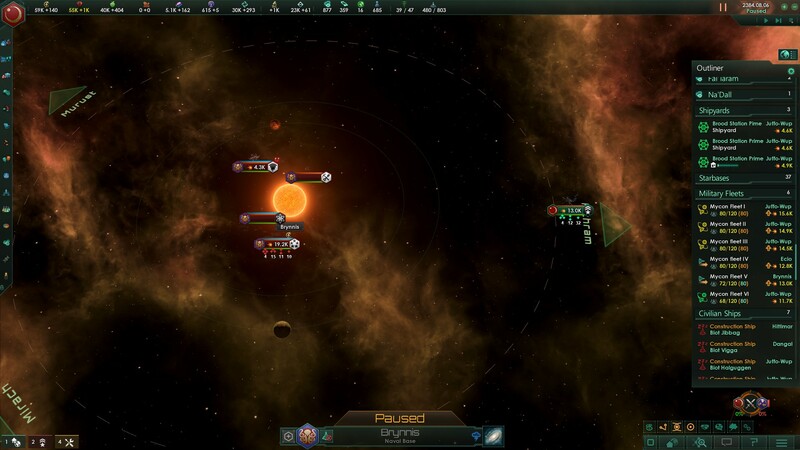 At this point we controlled ~20% of the galaxy, and things are going good, but, Juffo-Wup cannot wait, A single spore lands, finds nourishment in decay, so progresses Juffo-Wup. And progress we did, our next target were these poor fools. With Juffo-Wup spread to nearly 40% of the galaxy and the Mycon growing almost too powerful to stop, We'd say that about concludes it for this week's transmission. Gearing up to be your main opponent? 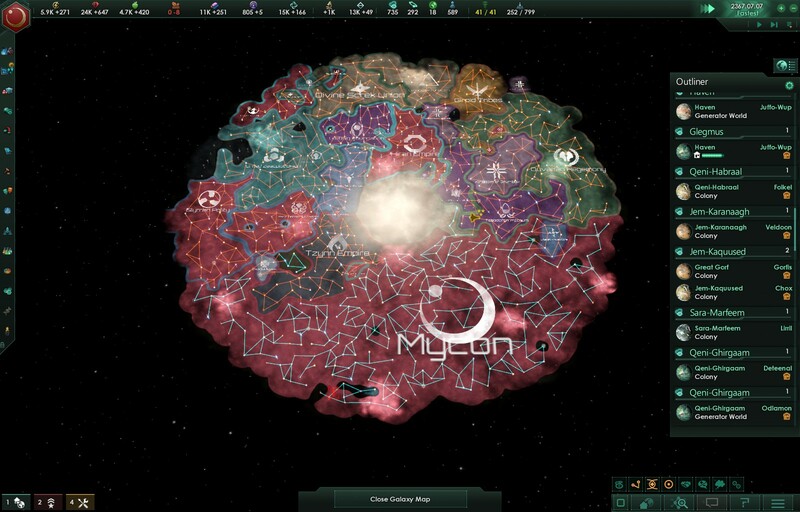 The color change was because I have it on unions mapmode, which shows me who is aligned with who. So, we will continue with our conquest, up, and to the rig-er left. 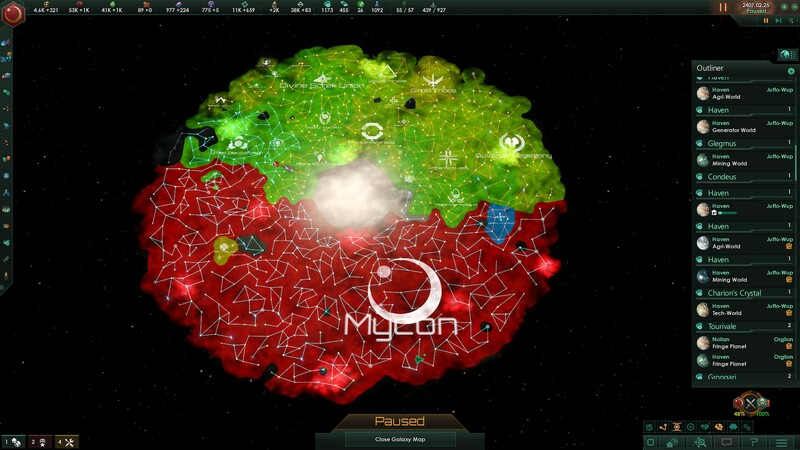 next taking on the glyrran Policy and their federation neighbors. 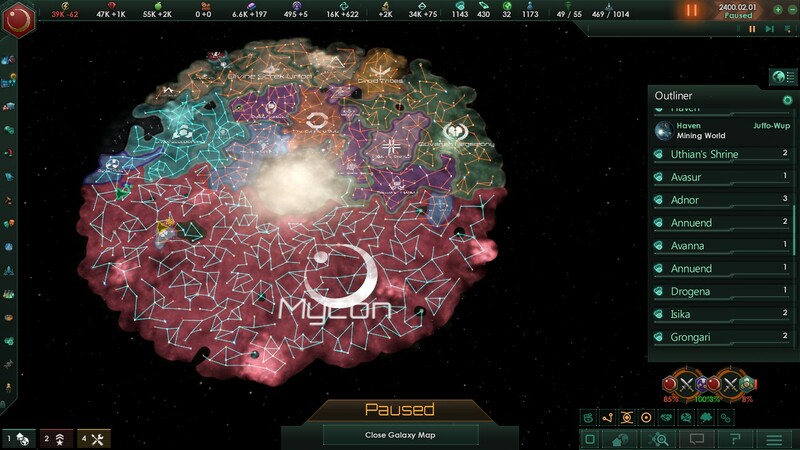 And, We had this great plan we had moved all our fleets back to a gate way we controlled, then we were going to send a medium fleet in and it would punch through their defenses and take their gateway before they even knew they were at war, then we would just swarm our fleets through our new gateway and quickly overrun them. Great plan right? 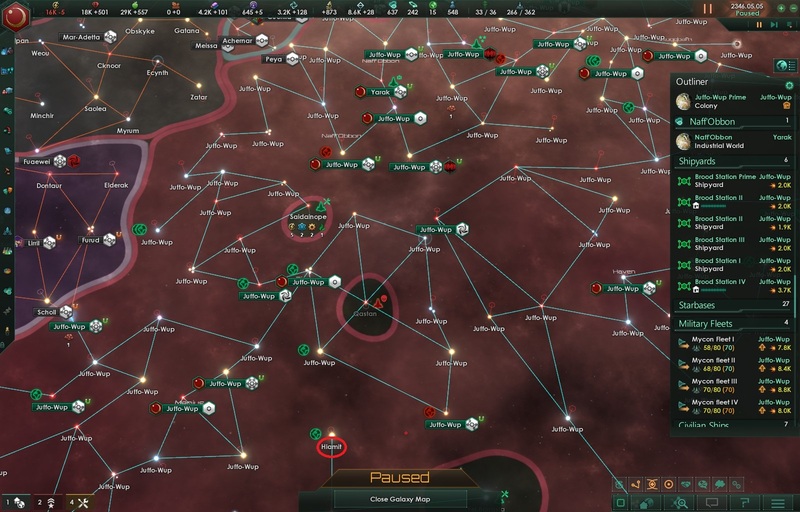 Well, I forgot to take into account the fact, that their gateway was in a nebula, meaning, We can't see into the system to get an idea of how strong their defenses are. But, no worries, I sure we can take and station they have... then We warped in..
And were met with this... yeah, We didn't win. 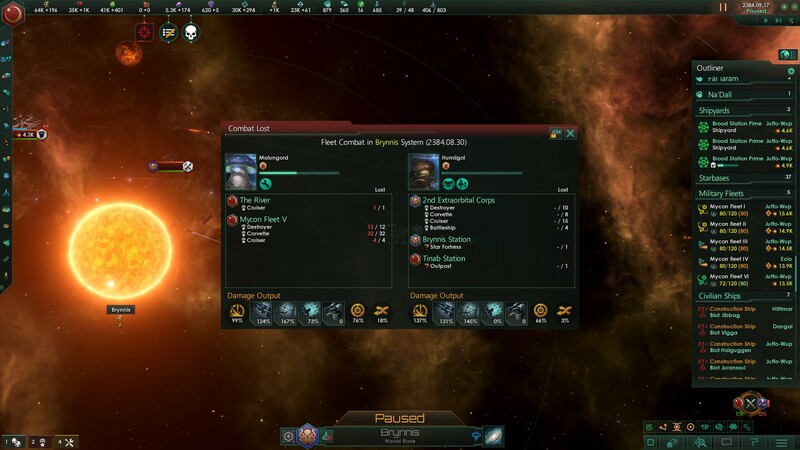 But Juffo-Wup cannot be held back for long, after some lightning fleet movements, and frantic panicking, and the AI being generally stupid, we were able to beat them back in no time and as one war was already drawing to a close. We figured why not just go barreling into another one! Sounds like the Antarans are back and attaking. Well, in MoO you had a chence defending a colony, or you just refounded it, but here it looks different. 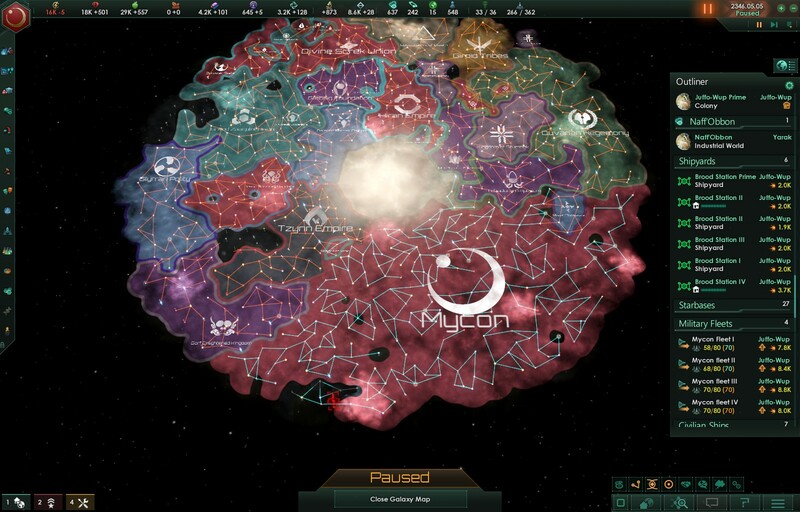 Looks like all your opponents willingly accepted the Obadin as their overlords (except for two, apprently, and both of them have too much border to defend against you to openly state anything against you). So, Juffo-Wup will have a much longer front to defend and advance than expected.